The Fed has a dirty little secret, one it has closely guarded over the past six years of unconventional monetary policy. This secret has eluded many journalists, commentators, and economists and led to much confusion over monetary policy. If it were widely known it would create far more criticism of Fed policy. For Fed officials, then, it is a secret better left unsaid. So what is this dirty little secret? To answer this question, we need to review two underappreciated facts about the Fed's quantitative easing (QE) programs. The Committee intends to reduce the Federal Reserve’s securities holdings in a gradual and predictable manner...The Committee intends that the Federal Reserve will, in the longer run, hold no more securities than necessary to implement monetary policy efficiently and effectively. Second, Fed officials, including Ben Bernanke and Janet Yellen, have reiterated these plans in speeches, talks, and Op-Eds. In short, the Fed's exit strategy was widely publicized. Fourth, the Fed signaled its intention to normalize the size of the monetary base by refusing to raise its inflation target even though some Fed officials believed it could have helped the economy. (See the last question in this exchange between former Fed Chairman Ben Bernanke and Senator David Vitter where Bernanke acknowledges potential benefit of higher inflation). By explicitly committing to not raise the inflation target, the Fed was implicitly committing to only a temporary expansion of the monetary base. Finally, and most importantly, bond markets have signaled they take seriously the Fed's commitment to normalizing the size of its balance sheet. This is evidenced by the relatively stable expected inflation implied by asset prices in the treasury market. If this group--the one that has the most skin in the game--believes the Fed's expansion of the monetary base expansion is temporary it should be a signal to the rest of us that the Fed is truly committed to doing so. The second underappreciated fact is that in order for QE to have made a meaningful difference in aggregate demand growth at the zero lower bound (ZLB) the associated monetary base growth needed to be permanent. This understanding is the standard view in modern macroeconomics. The reasoning behind it is that a permanent expansion of the monetary base implies in the long-run a permanent rise in the price level (even with with interest on reserves as shown by Peter Ireland). In turn, a permanently higher price level in the future creates the incentive to start spending more in the present when goods are cheaper. Or, from a Wicksellian perspective, it would imply a temporary surge in expected inflation that would lower real interest rates to their market clearing level. Below is a table that highlights a few prominent economists who speak to the importance of permanent monetary base injections at the ZLB. Given this understanding, many of them advocate some form of level targeting (either a price level or NGDP level target) as way to credibly commit the central bank to permanently expanding the monetary base in a depressed economy. The economic theory behind QE has always been flimsy...The problem is that, for this theory to apply, there must be a permanent increase in the monetary base… The Fed has given no indication that the current huge increases in US bank reserves will be permanent. It has also promised not to allow inflation to rise above its normal target level. 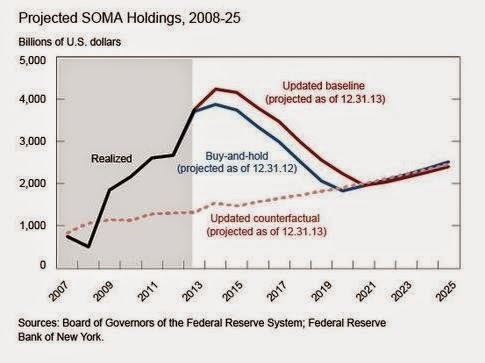 So for QE to be effective the Fed would have to promise both to make these reserves permanent and also to allow the temporary increase in inflation that would be required to permanently raise the price level in that proportion. Source: Financial Times. See also his comments at this Vox article or the bottom of page 237 through 239 of his famous Jackson Hole article. [I]n a liquidity trap… an expansion of the monetary base would increase inflation expectations and reduce the real interest rate only if it is seen as a permanent expansion. [O]ur analysis shows... that credibly permanent open- market operations will be beneficial as a stabilization tool as well, even when the economy is expected to remain mired in a liquidity trap for some time. That is, under the same conditions on interest rates that make open- market operations attractive for fiscal purposes, a monetary expansion that markets perceive to be permanent will affect prices and, in the absence of fully flexible prices, output as well...Our analysis suggests that Japanese policymakers should underscore the permanence of past operations, perhaps through an announced inflation target range including positive rates, and may need to increase the monetary base even more. [W]hen you’re at the zero lower bound, the size of the current money supply does not matter at all…what the models actually say is that doubling the current money supply and all future money supplies will double prices. If the short-term interest rate is currently zero, changing the current money supply without changing future supplies — and hence raising expected inflation — matters not at all… Central banks can change the monetary base now, but can they commit not to undo the expansion in the future, when inflation rises? Not obviously. Source: The Conscience of a Liberal. See also his post on helicopter drops here. Source: The Simple Analytics of Helicopter Money. Monetary policy is never very effective if the injections are temporary, and (almost) always very effective if permanent. Printing base money under quantitative easing does not imply hyperinflation because the expansion in the monetary base will be reversed once the recession is over. Source: Mainly Macro. Also see his helicopter drop discussion here. A good example of the importance of a permanent monetary base expansion at the ZLB can be seen in the Great Depression. As seen in the figures below, the monetary base grew rapidly between 1929 and early 1933 compared to previous growth. Yet during this time the money supply and nominal GDP continued to fall. 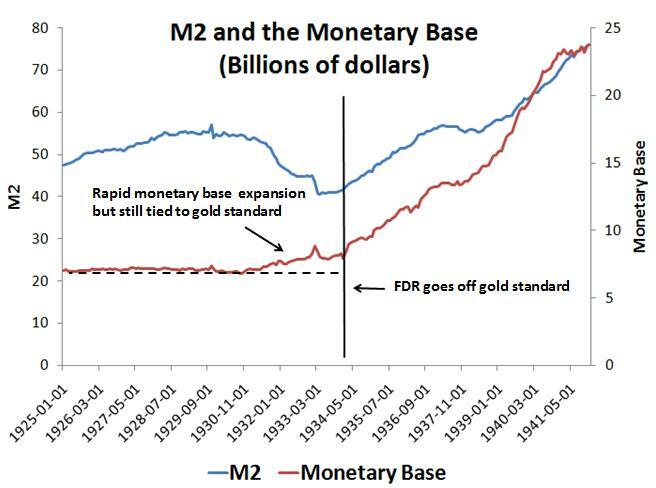 The reason is that the monetary base was still tied to the gold standard and therefore not expected to be permanent. But that changed in 1933. FDR created what Christy Romer calls a "monetary regime shift" both by signalling a desire for a higher price level and by abandoning the gold standard which led to even more rapid monetary base expansion. This shift is apparent in the figures below. FDR's actions caused the public to expect a permanent monetary base expansion that would raise future nominal income. A sharp real recovery followed in 1933. Though this real recovery was later stalled by other New Deal programs, it did permanently raise aggregate demand. By now you have probably noticed an inherent tension between these two underappreciated facts. On the one hand, the Fed never intended the expansion of the monetary base under the QE programs to be permanent. On the other hand, the monetary base injections needed to be permanent for the QE programs to really spur aggregate demand growth. And therein lies the Fed's dirty little secret: the Fed's QE programs were muted from the beginning. They never could on their own create the amount of catch-up aggregate demand growth needed to restore full employment. So despite all the Fed has said over the past six years, it made an explicit policy choice to avoid fully restoring aggregate nominal expenditures. Update I: Permanent monetary base injections are also important for fiscal policy to generate aggregate demand growth. This point is often overlooked by advocates of helicopter drops. See Paul Krugman, Simon Wren-Lewis, and myself for more on this point. If you are going to do helicopter drops, you need to do it the right way. Update II: This post should not be construed as me advocating a monetary aggregate or monetary base target for the Fed. I want to see the Fed adopt a NGDP level target which would imply a commitment by the Fed to permanently increase the monetary base if necessary to hit the target. The commitment is what matters, not whether it actually has to do so since a credible belief in it may cause the the public to do the heavy lifting via changes in velocity. This post is excellent. Of course the implication is that for QE to have worked properly, the inflation target would have needed to be set higher (at least temporarily) . Europe desperately needs this now. Can't we get economists to rally around at least this core concept? And if it had said that QE was permanent, a much much smaller QE would have been needed. The more QE it did, the less the percentage of QE that would be permanent, and the more QE it needed to do. What a mess! Nick, yes, its large balance sheet is evidence of its failure to do QE right. Unfortunately, many commentators fail to see this. Instead, they see the Fed's large balance sheet and the weak recovery and conclude QE doesn't work at all. So not only did the Fed fail to do QE right, but it also created more confusion that may come back to haunt the Fed in the future. "The Fed has always planned to eventually return its balance sheet and, by implication, the monetary base back to the trend path"
The Fed has done several studies on this question and conclude they may take a capital loss at some point in the future as interest rates go up (and the asset prices fall). However, the total profits from the Fed over the entire unconventional period should more than offset it. Note, however, that capital loss in general should not necessarily be a problem for the Fed in terms of undoing the monetary base as long as the net present value of its future seigniorage profits is greater than the outstanding stock of monetary base.
" In turn, a permanently higher price level in the future creates the incentive to start spending more in the present when goods are cheaper." Which , in turn , means spending less in the future , since more spending in the present means either less savings in the present or more debt in the present , both of which will crimp future spending. OK , so over the longer term , level targeting is simply aimed at "spending smoothing" . I can buy into that. It sounds an awful lot like credit-based "consumption smoothing" , only some of the "credit" takes the form of foregone savings or "borrowing from oneself" rather than as loans from banks. So , it's really just a variant of credit easing. Cool. Why don't you guys explain it that way? It's a much simpler concept for people to grasp. "Which , in turn , means spending less in the future , since more spending in the present means either less savings in the present or more debt in the present , both of which will crimp future spending"
No, this is not necessarily true. The context of this discussion is the ZLB where there is an sizable output gap or slack in the economy. In this context, the increase in current spending will push the economy back to full employment and thereby increase future economic activity too. So even though this may be "pulling forward" some future spending it also creating additional future spending. "The context of this discussion is the ZLB where there is an sizable output gap or slack in the economy..."
Even assuming there is a sizable gap , there is the consideration of equity , or fairness , in implementing your preferred policy. In order to prevent growing leverage among the already-indebted ( i.e. the working class and small businesses ) , you'd have to impose credit controls. Then you'd rely on borrowing or drawdown of savings to come from those who are not already levered ( the rich , big corps ) to "bring forward" aggregate demand. But they are only enticed to do so because they know that spending today is a bargain because of the permanent increase in the monetary base that you've engineered. So the rich get to participate in a big Blue Light Special while everyone else is credit-constrained. Hardly seems fair. There's a simple way to bring forward that aggregate demand that avoids this inequity. Tax the rich and spend the money , i.e. fiscal policy. Empty the vaults of the tax havens and you'll kill two birds with one stone : close the output gap and discourage corrupt tax-dodgers. The spending now creates velocity of money and increases the effect on the money supply which increases demand in the short term and as long as the velocity increases or the money supply increases so more demand in the future. No need to take money out of circulation until full utilization of resources. The myths of Keynes have been exposed many times, they form a list as long as A to Z... Abenomics to Zimbabwe. Never trust a memo that has no real world experience behind it, and cites nothing but theoretical models. "Keynesian Cross" indeed. Abenomics vs Zimbabwe? So which of those exposes the "myths of Keynes" seeing as they are diametrically opposite in nature? If you're going to put up posts that make no sense, you probably shouldn't use your real name, Ray. "The Fed has always planned to eventually return its balance sheet and, by implication, the monetary base back to the trend path it was on prior to the QE programs." The trend path includes growth in the MB though. Therefore much of the MB expansion is permanent right? Anonymous, a simple pre-crisis trend line or the projections made the by Fed studies above (see figures) imply very modest permanent increases in the monetary base since the 2008. So no, most of the monetary base expansion is not permanent. It seems like people expect excess reserves to be removed but people also expect growth in the MB. I don't see people expecting the trend of permanent MB growth to decline though. It doesn't make sense that the fed is targeting lower than 2% inflation if it is supplying more than enough MB to hit historical trend. Most expect the fed to retract the MB in the future but why would they retract it below historical trend when the time comes (maybe if inflation is excessive)? The reason they aren't expanding harder now is because they are supplying more than enough, they are far over historical trend. 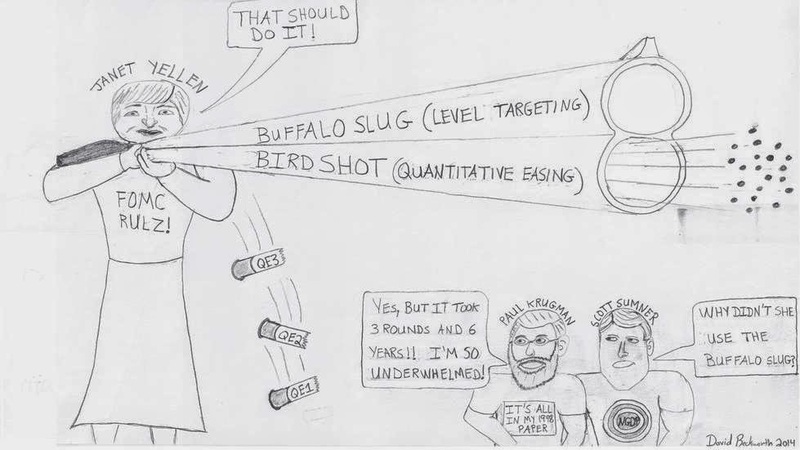 Under a level targeting regime cant the fed simply create vague targets or readjust them periodically? There needs to be something that holds the fed governors accountable through firing and incentives in order that they follow objectives and set clear ones. There is no such thing as a permanent monetary base growth. Any growth in the monetary base can later be offset by aggressively increasing taxation on various entities in the private sector. Even if the Fed were to literally drop billions of newly printed 100$ bills from helicopters, I'm not sure if this would actually lead to a pick-up in aggregate demand. Some economists seem to presume that permanently low interest rates or permanently higher monetary base or "helicopter drops" will necessarily raise the public's inflation expectations, which will in turn lead to higher inflation. I don't see why this should be. I agree. You can lead a horse to water but you can't make him drink. Woodford is clear that this means bank reserves must expand permanently. Is that the general view of the group? Has anyone made the argument that a sufficiently aggressive bank reserve expansion of temporary but meaningful duration could leverage up to a permanent increase in currency? Along the same lines, bank reserves eventually returned to normal levels coming out of the great depression. It took some time, but clearly that expansion was not permanent. So I intuit that the suggested success of that permanence was due to the currency component. And why couldn't the Fed make that same claim of intention today (except they haven't satisfied your inflation or price level targeting preference). In general, I find the use of the word "permanent" to be surprisingly imprecise in all these discussions. The word only has meaning relative to a counterfactual. For example, stepwise increments in a simple trend are permanent within the trend. JKH, thanks. Woodford in the above FT piece does say bank reserves, but elsewhere he says monetary base more generally. See his discussion in the Jackson Hole paper (link in above table to the right) starting bottom of page 237-239. Historically, most reserves eventually become currency so in practice that is probably what this group means. Excellent post. Both frustrating and enlightening to see so much agreement. The real fundamental disagreement though is the optimal level of inflation. Should the Fed have risked more inflation to speed the deleveraging processs? What is the magic of 2%, why not 2.5%? What de-leveraging, we are in a secular stagnation? Where is the deflation predicted from the huge amount of slack in the economy? "The reasoning behind it is that a permanent expansion of the monetary base implies in the long-run a permanent rise in the price level." I must say I am surprised to see such a consensus in favor of what seems to me on its face an argument that is both incorrect and dangerous, For surely a literal commitment to "permanently" expand B can only be justified under the assumption that no future changes could take place such as could require a reduction in it in order to avoid monetary excess. Though it may be old fashioned to appeal to the concept, as a matter of strict algebra there is still, so far as I'm aware, such a thing as a base-money multiplier, as well as a broader money multiplier. And just as it is possible for these multipliers to decline, as they did, notoriously, both after 2008 and after 1930, thereby calling for corresponding base expansion to avoid a monetary shortage, so is it possible for them to increase, thereby calling for opposite changes. To suggest that a "permanent" increase in B is ever justified is therefore either to deny that multipliers can ever decline, or to suggest that there can be too little money, but never too much! As for the "reasoning" in the quote above, it is actually perfectly misleading, for it is only valid assuming that there is no initial monetary shortage and, hence, no unemployment connected to such. The case for monetary expansion to aid recovery from a recession is, on the contrary, based on a presumption that the recession is due, at least in part, to a money shortage, which in turn implies a state in which P<P*. Monetary expansion in this case serves, not to raise (actual) P, but to raise P*, eliminating the gap between it and (actual) P. On the other hand, if M expansion raises actual P proportionately, that is proof that there was no monetary shortage to begin with. Similar reasoning gives the lie to suggestions that to be effective in combating unemployment, monetary stimulus must involve a commitment to a higher inflation target. Baloney. The problem, when you have cyclical unemployment, isn't that the "target" rate of inflation is too low. It's that the equilibrium rate is lower than the target rate. Finally, there are all sorts of reasons, apart from ones having to do with getting the money stock right, for wanting the Fed to shrink, the chief one being that it is unhealthy to have trillions of dollars of the public's monetary savings "permanently" diverted from private sector intermediaries to the Fed. To doubt this one must suppose that central banks are generally as capable of investing savings productively as private ones. Even allowing that so many private intermediaries have behaved extremely badly recently, I doubt the general proposition to be sound. Historically, it certainly hasn't been, as one may gather by reading the literature on financial repression, or, for earlier evidence, Rondo Cameron's terrific volumes on banking and industrialization. George, the reasoning above is simply the long-run quantity theory that I know you buy into. Yes, the velocity of money can change for numerous reasons and so to be precise this is a commitment to permanently expand the base if necessary. If credible, this commitment would cause the public to do the heavy lifting through changes in velocity and require little change in the monetary base. 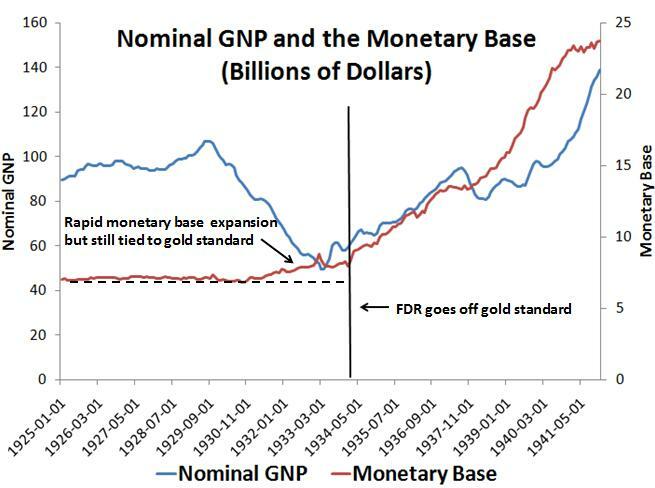 As Nick Rowe mentions above, had a level target been in place (which would commit the Fed to a permanent expansion if necessary) then there monetary base expansion would not have been so large as the public would have change its demand for base money. "George, the reasoning above is simply the long-run quantity theory that I know you buy into." No: I don't "buy into" the proposition that an increase in M leads to a corresponding long-run increase in P when the increase in M occurs at a moment when P happens, owing to some previous disturbance, to be above its equilibrium value. Nor should you! "Note, however, that capital loss in general should not necessarily be a problem for the Fed in terms of undoing the monetary base as long as the net present value of its future seigniorage profits is greater than the outstanding stock of monetary base." Can you elaborate? It's not the monetary base that is at risk from Fed losses - it's the capital position. JKH, yes, the capital position is separate from the monetary base. What I was trying to say is that if the capital position takes a hit such that the Fed's liabilities (monetary base) are greater than its explicit assets this need not necessarily be reason for alarm. Many observers, though, would see this as a reason for alarm as it would suggest to them that the Fed was insolvent and not be able to reign in inflation. That is, the Fed would not have enough assets to retire the monetary base. My point was that this is not true if the net present value of future seignorage profits (an implicit asset) exceeded the monetary base. The Fed could use this implicit asset to retire the monetary base. An interesting wrinkle which I think you're aware of is that the Fed announced a couple of years ago that it would avail itself of the option of capitalizing that NPV - not as an asset, but as a negative liability - if and as much as needed in the circumstances. The intuition around the negative liability as I see it is that if the Fed runs into temporary negative margin pressure and incurs losses because of self inflicted interest rate gapping pressure (by increasing IOR against a long duration Treasury asset book), it will claim a future retention or claw-back of expected future profits that would normally be remitted to Treasury, rather than charge a current loss against capital. It will hold back on the remittance of those expected future profits when they actually materialize down the road until whatever negative liability was created has been eliminated. This was subject to predictable criticism at the time, but I always thought it was a ballsy and bullish statement of confidence in long term monetary policy and seigniorage capacity. In all fairness, such "negative liability" should carry an interest rate tied to the FFR (or maybe even to long-term government bonds, since the Treasury won't really be able to pull these funds on demand). The Treasury is not in the business of handing out money for free, last time I checked. The whole "negative liability" thing is quite shady and distasteful, in my opinion. If the Fed finds that it doesn't have enough (liquid) capital to pay Janet Yellen her monthly salary, will it simply conjure up new reserves from thin air, transfer them to Yellen's bank account and then adjust its books accordingly with a "negative liability"? Is there a precedent for this kind of "creative accounting" in the history of central banking? That's an understandable view and much more prevalent than my own. Regarding interest on the liability - maybe a good idea but wouldn't be material in the context of the basic idea of drawing on future seigniorage capacity to cover current losses. On Yellen's salary - that gets paid from the capital account and not reserves. (And she should be paid a decent multiple of what she actually gets, IMO). On the general idea, the Fed has remitted hundreds of billions in profit to the Treasury in recent years, which was a direct saving for taxpayers. That was an isolated but huge marginal benefit from embarking on QE. It should be cut some slack and not have to go hat in hand to Treasury for contingent recapitalization on what would certainly be much smaller scale temporary losses. P.S. : Your Yellen caricature is excellent! David, Very good post. The vertical line showing where we went off gold is a bit too far to the right. It should be right at the bottom of the NGDP line. What about demand for MB? Maybe people are expecting permanent growth in MB but the demand for it by banks has increased at ZLB because of low risk adjusted returns from investment. Any further increases in MB at ZLB only contribute marginally to spending needing exorbitant increases in MB which are deemed risky by fed. Therefore it seems to be a case of riskiness of being more expansionary not a case of lower MB growth expectations. Does that seem reasonable? Great cartoons. Yes, QE should have been open-ended and results-dependent from the start. Also---this is just my view: QE works as the sellers of bonds have to do something with their proceeds (freshly printed money btw, or digitized anyway). They now can place an immediate claim on goods, services and assets (property, equities, other IOUs) that they did not have before they sold their bonds. So, if the bond sellers buy goods and services great, other assets good, and if they put the money in the bank and the banks sit on it, not so great. From what I see after 30 years in a variety of businesses, is that no one ever mentions the Fed, even in the real estate trades. Ideas like QE? No one even knows the Fed did QE. I bet 3% of Americans could identify Janet Yellen and what she does. And those 3% are rattled by conflicting statements by FOMC board members. People are not cognizant the money supply has, or has not doubled. They have zilch expectations of the Fed. QE is 10-minute daily exercise program to lose 12 pounds a week. In short, I do not think Fed guidance means anything except to a small coterie of academics, and maybe some Wall Street bond houses. And even they are not sure what Fed tea leaves mean. But! The people who sold their bonds may spend a portion of their proceeds on goods, services and other assets and that is were the stimulus comes from. Probably the best thing for the Fed to do is simply sit on the bonds it bought, or more accurately, maintain the size of the bond hoard. It is like a tax cut for Americans, as the interest goes to the Treasury. Okay this has been a ramble. But the question remains: Is not QE stimulative even if people have zero expectations of the Fed? After all, the fed put $4 trillion into their hands? That's more persuasive than blah-blah, isn't it? And, in real life, if 97% of the population is unaware the Fed is doing something like QE, does it matter about expectations? QE or quantitative easing (LSAPs), is a misnomer when remunerating excess reserve balances and its simultaneous sterilization (due to an inverted wholesale funding yield curve). The outsized balance sheet expansion was required for credit easing - not so much the countercyclical injection of new money. Thus, to call the monetary base a base for the expansion of new money and credit is obviously spurious (it was before the IOeR policy, and doubly so afterwards). And any comparison of the base during the Great-Depression to today is also dubious.. The CBs didn't need bailed out by QE or TARP. It was the NBs that operated recklessly. And it was Bankrupt U Bernanke that not only solely caused the Great-Recession but also destroyed NB lending/investing during its trough (exacerbating the decline and prolonging its rebound). If the Fed had been concerned about delivering a V shaped recovery they would have set up a RP facility to deal directly with NB counterparties (like they did with the RRP facility to tighten their grip). I would be interested what those who consider that permanence of QE matters consider to be the mechanism by which this works. As Benjamin Cole says, I doubt whether many holders of money have a clue about Fed operations or intentions, but maybe there is some mechanism by which informed investors hoard money in anticipation of the Fed having to offer a good deal to buy it back. I find the idea that the NPV of future seigniorage gives the Fed some security (being promoted by Buiter) absurd. If a central bank does things that start drawing on that NPV, such that their ability to maintain the value of their currency comes into question, that NPV is toast. 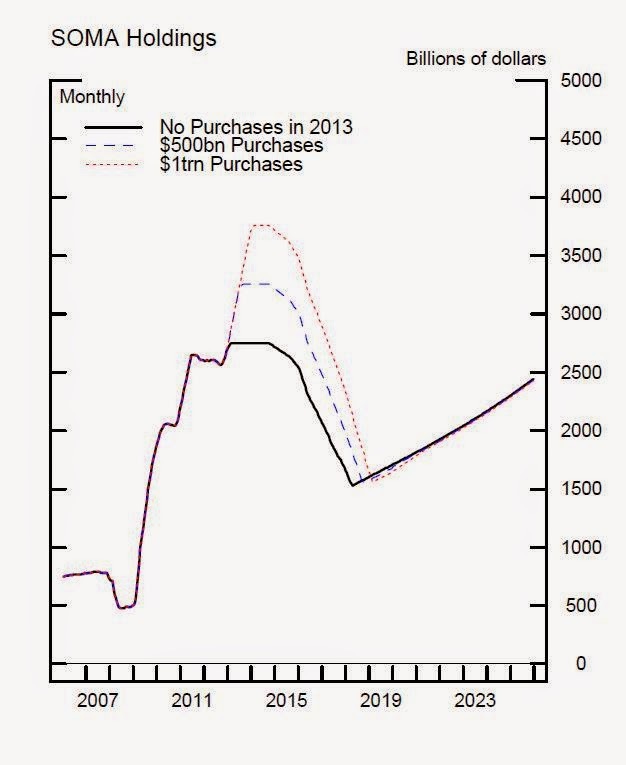 Can't the Fed simply offset its deteriorating MBS holdings with non-borrowed reserves? I am starting to doubt the Market Monetarist claim that only permanent monetary base increases can bring inflation. After all, according to Market Monetarists, the QEs did prevent deflation. So what do we have? Temporary increases in the monetary base can prevent deflation but cannot cause inflation? That claim seems to at least require an explanation. Does QE actually add any additional money to the economy though? I thought it was just an asset swap that encouraged the holders of cash to go and find ways to invest. So the effects would be secondary, via lower interest rates and the cash (swapped for existing bonds) looking for somewhere to be invested and so pushing up asset prices. So QE is just monetary policy, not fiscal, as it it doesn't change the net position of the private sector.